New research suggests a companion's supernova blast catapulted a rare dwarf carbon star, SDSS J1128, to extreme speeds. The strange runaway star, which is rocketing along at more than 960,000 miles per hour (1.54 million kilometers per hour), is stained in carbon even though it's too immature to have created the stuff itself, scientists said. 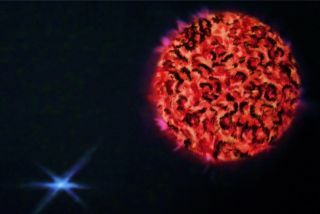 "You're looking at this very, very, very rare star that's moving at cannonball velocity," study co-author Bruce Margon, an astronomer at UCSC, told Space.com. "That got us thinking — maybe there's something about it being a dwarf carbon star that has to do with it having this crazy-high speed." Their top guess is that the speedy star was in a binary system with another star that imbued it with carbon before dying in a massive supernova explosion, shooting the first star out and away. The situation may be similar for several other "cannonball" candidates the researchers have identified. That unusual carbon content is the key "extra clue" to the speedy stars' origin, said Plant, the new work's lead author. "For many stars, we can look at them and see how they're moving now, but we often don't have a lot of clues to what they might have been doing in the distant past," she told Space.com. "Since [the star] carries this material mark, we have a clue to what it was doing in the past." The star in question, called SDSS J112801.67+004034.6 (SDSS J1128 for "short"), was originally measured through the Sloan Digital Sky Survey in March 2000. Along with about 500 others found so far, it seems to fall into the strange stellar category of "dwarf carbon stars." Different than a "white dwarf," the super-dense remnant left at the end of a star's life cycle, a dwarf carbon star appears to be in an early stage of evolution but contains a high level of carbon. That's odd, because carbon is usually found shrouding red giants, which are in a much later stage. An image of the newly measured "cannonball" star SDSS J1128, as taken by the Sloan Digital Sky Survey. "The mere existence of these stars is kind of perplexing, because they are adolescent stars — they are stars at about the same evolutionary stage as our sun," Margon said. "There shouldn't be such a thing as a dwarf carbon star, because there's no way for that star to have created carbon given where it is in its life cycle." Instead, researchers theorize that each of these stars once orbited together with another star, a companion, which was in a later part of its life cycle and had already produced carbon. If the binary stars orbited closely enough, one star's carbon could transfer to the other. The transfer of mass could happen peacefully over time — "a gentle wind puffed off for millions of years," Margon said — but the two stars' association might end on much more violent terms when the more mature star explodes into a supernova. SDSS J1128 first came to the researchers' attention because of how quickly it was speeding away from Earth, which researchers calculated based on distortion in the wavelengths of light it put out in that first measurement. They followed up by measuring the star with Hawaii's Keck Observatory in April 2015, and found that it was still moving away at about the same speed. But not only that: After looking at the star's location from surveys over many years (the earliest was in 1955), the research team realized that it was visibly sweeping across the sky as well, not just fleeing from Earth. That implied that the star was dimmer and close, rather than far away and very bright. Incorporating images from 1955 to 2009, researchers calculated how the star SDSS J1128 was moving with respect to the backdrop of stars behind it, and combined that with its velocity away from Earth to estimate its total 3D motion through the Milky Way. The red circle shows the star's expected position if there was no motion. Researchers know stars can pick up incredible speed by whipping around the supermassive black hole in the Milky Way's center, so this was one of the first possible explanations for this star's great velocity. But once the collaborators calculated its approximate location — between 3,000 and 10,000 light-years away — and its speed compared with the center of the galaxy, it became clear that the star was not on that type of trajectory. "Even though we don't have one exact number, we can understand what it's most likely doing," Plant said. "We can rule out […] certain motions that are not possible, and that lets us conclude that it's not coming from the center of the galaxy, which is one of the main questions we wanted to answer, and also lets us conclude that it is bound to the galaxy but it's on an extremely eccentric orbit." So they turned to the supernova possibility. Other stars' speeds have occasionally been attributed to the driving force of a supernova, the researchers said, but evidence has not been conclusive. To find out more about the high-speed star, researchers can take follow-up measurements to check for tiny variations in the speed at which it's moving away from Earth, as well as more about its chemical composition. Ultimately, projects like Europe's galaxy-mapping Gaia mission could provide even more precise data about the star's location, if it falls within the satellite's view, the researchers said. The star is one of a few candidates the researchers found for this extreme motion — it had the fastest velocity of the bunch relative to Earth, but the others could prove even faster when measured in the context of the entire galaxy. Comparing the traits of all those "cannonball" stars could help solidify the supernova explanation or suggest another mechanism. "The fact that this is a super-high-velocity star isn't going to go away," Margon said. "The interpretation might change."